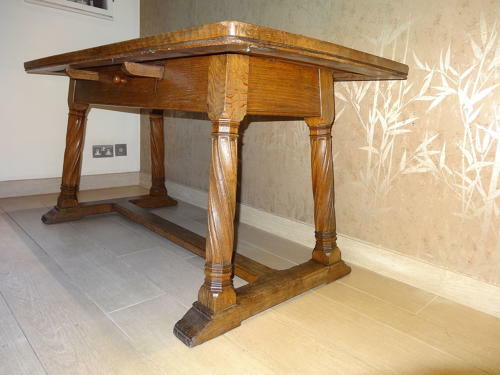 Liberty & Co Arts & Crafts oak dining size table; with typical spirally fluted Lorimer legs; the whole on a H-stretcher. Great muscular look base throughout. Originally made for the Liberty & Co Tudor Building in Great Marlbororugh St, London c1924. Approx 5ft wide, 30" high and 30" depth. Useful central drawer to one side. Table top slightly bowed but fine.